Lost volume on the face is at the root of many signs of aging. As we age, our faces lose fat volume which can lead to a tired, worn out, and sunken look, especially in our cheeks. This can also lead to loose skin on the face, and sharper, skeletal features. One of the best methods for restoring your face back to its youthful, glory days is through a facial fat transfer procedure. The facial fat transfer gives natural-looking, long-lasting, anti-aging results. Dr. Brown and his staff have performed countless facial fat transfers and have the experience needed to help you achieve your most beautiful self. Dr. Brown is a board-certified plastic surgeon with a passion for helping his patients regain their self-confidence and achieve their cosmetic goals. With a keen eye for achieving results that are in line with your body’s best features and natural anatomy, Dr. Brown can help you reverse the clock on facial aging. We can help you determine if you would benefit from a facial fat transfer and if it’s the best option for you. Schedule your consultation today! A facial fat transfer is a facial augmentation and rejuvenation treatment. It specifically addresses aging symptoms that are unique to the face such as sunken cheeks, nasolabial folds, tear troughs, and sunken temples. Facial rejuvenation with a fat transfer requires a specialized artistic eye and mastery of injection methods to achieve natural results. Although fat is often seen as the enemy to our cosmetic goals, it can be quite a powerful anti-aging tool. A facial fat transfer, or facial fat grafting, is unlike most cosmetic procedures because it takes advantage of fat deposits already in your body and repurposes them for facial rejuvenation. This procedure involves removing fat cells from the body via liposuction and carefully injecting them into precise areas of the skin where it can restore volume and perkier appearance. This is most helpful for clients who have aged and lost collagen and fat in their face, which results in a hollow or sunken look. This procedure is a win-win for both parts of the body that are affected because it removes fat from one part of the body (most commonly from the abdomen, thighs, and upper arms), and adds it to areas of the face where volume is needed. This results in a safe, natural, and effective procedure that can make all the difference in your appearance. A facial fat transfer is, in basic terms, a liposuction treatment with an extra step that uses the fat to help rejuvenate the face. Facial fat transfers can effectively turn back the clock on your appearance. Since the substance used to achieve volume is your own fat, then the results look all-natural because they are, in fact, all-natural. Essentially, facial fat transfers have a recycling approach and use your own disposed fat for good. This leaves patients not only satisfied with the volume and youthfulness of their face, but it leaves them satisfied with their new look in the areas where the fat was removed. Facial fat transfers are revolutionizing anti-aging and rejuvenation treatments, giving patients long-term, natural-looking results. Patients who want effective treatment to their face but want to stay away from artificial substances in fillers from entering their body may find that a fat transfer can be their most ideal option. Facial fat transfers are a natural approach to combat signs of aging and provide much longer lasting results in comparison to synthetic injectable fillers. At times, the body may have an allergic reaction to the materials in a filler, creating complications and discomfort. With a facial fat transfer, fat tissue poses no risks of allergic reaction and rejection from the body. Dr. Brown and his staff can further advise you on the benefits of a facial fat transfer. Adult men and women in good health who have lost their youthful, perky appearance due to lost facial volume are ideal candidates. Fat injections for lip augmentation can be performed for patients after the age of 20 and most patients seeking facial rejuvenation are over the age of 35. Ideal patients have realistic expectations and goals with this procedure, choosing to undergo treatment to fit their personal goals rather than someone else’s. Patients may also be an ideal candidate for a facial fat transfer if they maintain a healthy lifestyle filled with exercise and a healthy diet, and be non-smokers. Patients should have an area of the body with sufficient excess fat to serve as their donor site. Dr. Brown will be able to determine the exact amount of fat necessary for a treatment during a consultation. You will meet privately with Dr. Brown. During the consultation, you will express your concerns, point out particular problem areas, and explain your goals and expectations with undergoing a facial fat transfer. Once Dr. Brown knows a bit more about your individual scenario, then he will perform a physical evaluation, review your medical history, and inquire about pre-existing conditions you may have. The goal with your consultation is to ensure you are confident and informed about the treatment, which is essential for ensuring a great experience. Then our staff will provide you with instructions on how to prepare for this procedure to ensure you have a pleasant experience and a speedy recovery. For those who qualify, an accurate price estimate for the procedure will also be provided at this time. Request time off from work, to ensure that you are given the time and freedom to recover. If you have any questions or concerns about your preparation, feel free to contact our office and we’d be happy to help you. The micro-droplet method yields smoother, natural results. Facial fat transfers begin with marking both the area of the body where the fat will be removed and marking the area of the face where the fat will be transferred to. The initial fat removal phase is performed using tumescent liposuction and local anesthesia, meaning you will be awake and comfortable during the entire process. Local anesthesia and tumescent liposuction are ideal because it is a safer technique and avoids general anesthesia, which carries certain risks. Once an adequate amount of donor fat is collected, it is then purified and cleaned by specialized centrifuge, which will improve fat re-uptake rates. Once the fat is cleaned, Dr. Brown will then inject the fat into the marked areas of the face with a smaller needle using the micro-droplet method. After the procedure, you will be wrapped in a compression garment around the donor area to reduce swelling and aid healing. The patient will then be taken to our state of the art recovery room to rest and review all recovery instructions before they leave our office. We recommend that the patient do a light walk the night of the procedure to assist with blood flow and circulation. We will provide the patient with prescription medication to aid in any discomfort that is to be expected in the first couple of weeks. Swelling and bruising are common and should disappear within 3 weeks. After the bruising and swelling fades, then the optimal results will become clear. Results will be natural-looking, youthful, and long-lasting. In many cases, facial fat transfer results last a lifetime. The results of a facial fat transfer leave our patients with a newfound sense of confidence, rejuvenation, and inspiration to continue to lead a healthy lifestyle. 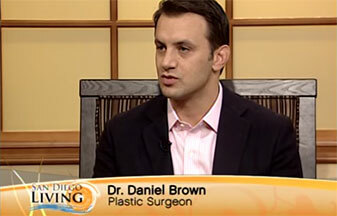 Under the expertise of Dr. Brown, patients will truly look and feel younger after they undergo a facial fat transfer. If you or someone you know is interested in a facial fat transfer, then please don’t hesitate to contact our office. Let us help you achieve the best, most vibrant, youthful you!